We have just tested the new Italian restaurant Margherita in Saint Germain . And it’s also beautiful as good, with its industrial decoration and its hams were hung on the ceiling and they have delicious pizzas and pastas. Tiramisus looked so tasty, we can’t to resist to eat both versions! For the children, they installed in one of their many rooms, a space only for them with bricks of constructions, books and a big blackboard! 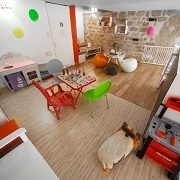 Depending on the number of customers, the room of restoration near the playroom is not always open. The staff are attentive, it is certainly possible to ask to your waiter, if you can have your coffee near the gaming room. 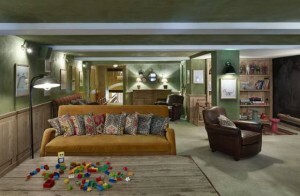 Rooms are big enough and tables spaced out to be able to circulate with a stroller, some room are in the floor so you have the choice between to take staircases or elevator. Come to discover this friendly place where the children are as much welcome as adults and where you will please your taste buds and your eyes. A nice finding 2 steps away from the Canal Saint Martin. At the beginning, there was Anouchka, a children’s clothes designer. And then there’s her mum, a children’s toys professional. 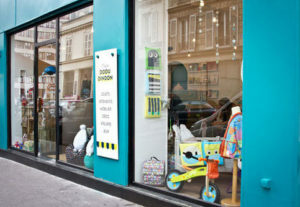 Together they funded La Maison DoDu DinDon, a concept-store dedicated to children. You’ll find there DoDu DinDon children’s clothes (of course), but also a pretty selection of other French and foreign designers (Bbamie Création, Boumaga, Barnabé aime le café, Pöm, Maxomorra) ; but also a lot of toys, some “classical” ones (Vilac, Janod…) and some exclusive ones, found in France or abroad.